We get back the Hambacher forest. Symbolic by walking through it, feel it and to inform about about a lot of things and to get informed. Originally published by Initiative “Buirer für Buir” Facebook event page. Edited machine translation by Enough is Enough. Michael Zobel and Eva Töller invite you and we are happy to assist. It is not a normal forest walk. It is a Sunday walk, because we will not come into the forest which is massively damaged by RWE with the help of the state government and police. Despite standstill agreements with the higher administrative court of Münster against cutting the trees, RWE has massively damaged the forest with flimsy backing from the state government. 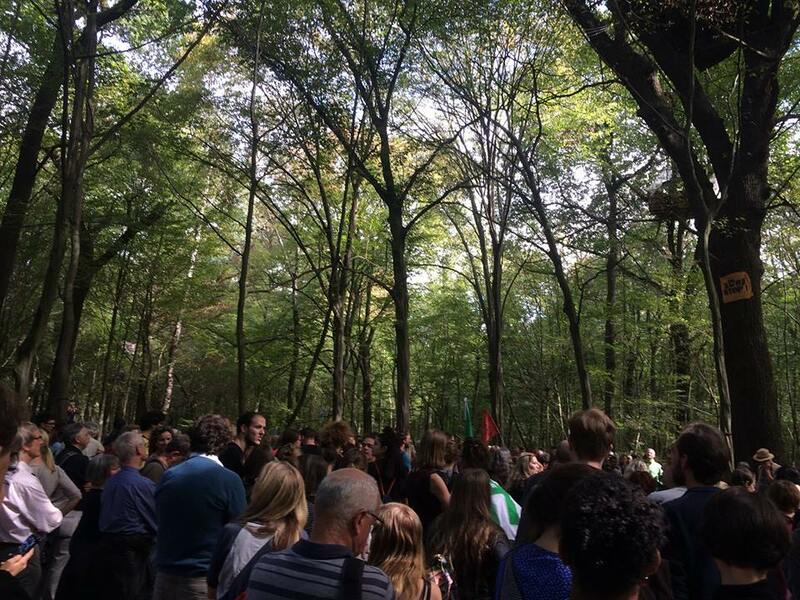 It is now up to us whether the ever-shrinking remainder of the Hambach forest is still a symbol of humanity’s future prospects, of the Paris climate targets or as a symbol of NRWE’s annihilation. No – on Sunday we do not want to look into all possible abysses, but forward. We want to set a clear example for the forest, for the climate. Whether for two, two hundred or perhaps several thousand. Are you there to support the forest walk? To show presence? Please reckon with massive police checks. So: A S-Bahn (= one hour) drive earlier, take identity card. Patience and relaxation and lots of water. Take it with humor when you are checked and don’t provocate and let them not provoke you. It may also be that we do not walk because we are not allowed into the forest. Then we will find a way to express our support for forest and climate – peaceful, creative, visible, audible. Still, we expect to meet again but this time at Buir train stafion. If not, you’ll read it here or learn via Twitter or at the train station, or at the grand vigil between Buir and Morschenich.